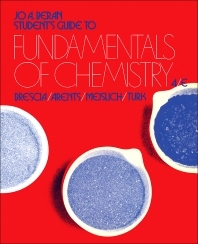 Student's Guide to Fundamentals of Chemistry, Fourth Edition provides an introduction to the basic chemical principles. This book deals with various approaches to chemical principles and problem solving in chemistry. Organized into 25 chapters, this edition begins with an overview of how to define and recognize the more common names and symbols in chemistry. This text then discusses the historical development of the concept of atom as well as the historical determination of atomic weights for the elements. Other chapters consider how to calculate the molecular weight of a compound from its formula. This book discusses as well the characteristics of a photon in terms of its particle-like properties and defines the wavelength, frequency, and speed of light. The final chapter deals with the fundamental components of air and the classification of materials formed in natural waters. This book is a valuable resource for chemistry students, lecturers, and instructors.